This Mississippi state motto is a Latin motto and in English it means “By Valor and Arms”. "Valor" may be interpreted as 'courage' and the intended meaning of "arms" may be 'strength'. The Mississippi motto has not been adopted as an official motto but has appeared on the Mississippi coat-of-arms since 1894. The Mississippi motto was suggested by James Rhea Preston (the Mississippi superintendent of education). Interestingly, the Mississippi motto may have its roots and inspiration from another motto with a subtle, but somewhat different message. This motto created by Lord Gray De Wilton: "Virtute Non Armis Fido" (I trust in virtue not arms). 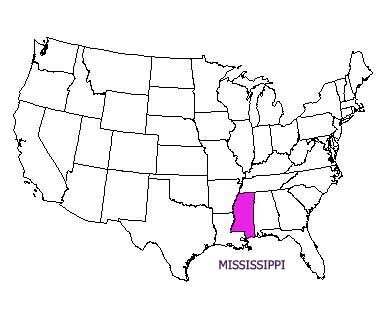 Whereas the state of Mississippi does not have an official Mississippi state motto, it does have an official state nickname: "The Magnolia State". The beautiful and stately Magnolia which also happen to be the state flower as well as state tree is also displayed on the state quarter from 2002. "The Eagle State” and “The Border-eagle State"
On the Mississippi coat-of-arms is featured an eagle, hence "The Eagle State". This Mississippi state nickname is especially valued and used as warm and welcoming image by the Mississippi tourism industry. This Mississippi state nickname is a reference to the marshy streams that go through the lowlands along the great Mississippi River and out into the Gulf. Mud-cats are a nickname for cat-fish that are found in large sizes in swamps and rivers, including the Mississippi River and Tennessee River which offer several different species of the cat-fish. There is no explanation to this nickname other than a once assumed large number of Ground-hogs in the state. No explanation of the origin on this nickname is available. "Mississippi - Feels Like Coming Home"
This is the Mississippi tourism slogan from 2002. "Mississippi - The South's Warmest Welcome"
This is also a Mississippi state slogan. Some of these Mississippi funny state slogans can be bought on t-shirts and stickers. Or maybe Alabama, Alaska, Arizona, Arkansas, California, Colorado, Connecticut, Delaware, Florida, Georgia, Hawaii, Idaho, Illinois, Indiana, Iowa, Kansas, Kentucky, Louisiana, Maine, Maryland, Massachusetts, Michigan, Minnesota, Missouri, Montana, Nebraska, Nevada, New Hampshire, New Jersey, New Mexico, New York, North Carolina, North Dakota, Ohio, Oklahoma, Oregon, Pennsylvania, Rhode Island, South Carolina, South Dakota, Tennessee, Texas, Utah, Vermont, Virginia, Washington, West Virginia, Wisconsin, and Wyoming.